Image courtesy of NATO Allied Command Transformation, Norfolk, Virginia. 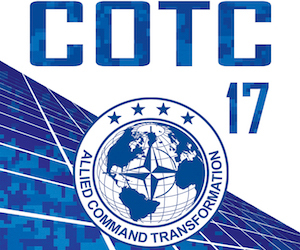 The North Atlantic Treaty Organization’s Allied Command Transformation met in Norfolk, Virginia for the 2017 Chiefs of Transformation Conference on Wednesday and Thursday, Dec. 13-14. The main agenda during the conference was to prepare for the future of the military alliance’s member nations and partners by discussing pressing matters and viable solutions. NATO ACT primarily specializes in defense planning and government affairs; the conference emphasized effective communication and understanding of current world affairs. COTC was structured by syndicate sessions for different areas of focus. The sessions were open to both military personnel and civilians. Upholding the conference’s “Prepare for Tomorrow, Share the Future” agenda, NATO officials participated in open discourse with conference attendees. Facilitators began the discussion with the topic of effective decision making to develop an understanding of how ACT could develop new approaches in both current and future operations. Among the decision-making challenges discussed was developing a stewardship command style, preparing decision makers and common understanding. While multiple participants expressed individual perspectives, one reoccurring position was that a long-term generational approach should be taken. One participant expressed that millennials should not only be included during the decision-making process when they reach high ranks, but at all levels. Another speaker asserted that while an emphasis on training future decision makers is vital, the improvement of current personnel is also of importance. Towards the end of this syndicate, facilitators invited interested participants to follow up for future collaboration on implementing information discussed. During the conference, media students from Virginia Wesleyan University, Norfolk State University, and Old Dominion University were allotted time to speak with NATO personnel. The students met with ACT Command Senior Jack Johnson, Chief of Staff Air Marshal Sir Graham Stacey, and Deputy Supreme Allied Commander Admiral Manfred Nielson. First, Command Senior Jack Johnson spoke with the students about the importance of the conference and the purpose of NATO. Senior Johnson told the student press that the COTC’s efforts were for them and that NATO is in place to maintain help people of the member nations feel secure. He went on to explain how the operations of NATO affect the daily lives some countries outside of the NATO charter. One student mentioned that some people who are unaware of NATO’s operations are under the assumption that NATO’s purpose is essentially conflict based. Admiral Manfred Nielson reinforced this sentiment by also expressing that NATO prioritizes international relations. The COTC annual conference helps NATO prepare for the coming year and emphasizes the continued development of communication among NATO partners, as well as the need for innovation and common understanding. Tags: conference, COTC17, Global, leaders, Leadership, Military, NATO, Norfolk, Norfolk State, North Atlantic Treaty Organization, NSU, security, world. Bookmark the permalink.